Money matters to people. People matter to us. Veterans matter at Visions. You served your country, now we’re here to serve you. You stood up for our communities, we’re committed to helping them. Basic budgeting, understanding credit scores, couponing, and more. Our on-site professionals bring together the comfort of the credit union experience with the convenience of keeping all your money matters together. Let us find the best mortgage product for you – whether it’s your first home, next home, or refinance. Counseling by our Medicare experts is available by appointment or through one of our regular public seminars. Members can take advantage of our insurance partners for personal and business needs. We offer these services at any of our locations, and by special request at Veteran-based organizations like VFWs and American Legions. Look for free defensive driving courses throughout the year, as well! Each year, we make five $1,000 scholarships available to children of Veteran members. This thank you to the Veteran community is available for undergraduate or graduate study at an accredited U.S. college, vocational, or technical school. Visions gives back on your behalf through this exclusive program for Veterans. 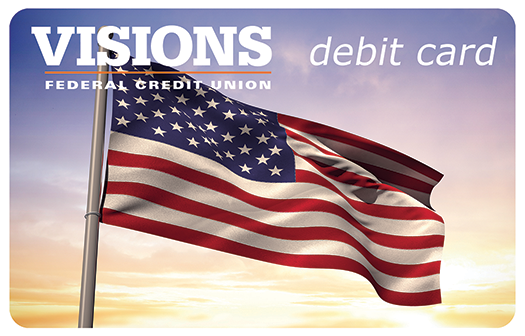 For each member who chooses a patriotic debit card design, we’ll make a $5 donation to Operation Homefront. It’s our way of giving back to you and all the Veterans who make day-to-day life in our communities possible. Operation Homefront is a not-for-profit whose mission is to build strong, stable, and secure military families so they can thrive in the communities they have worked so hard to protect. For over 15 years, Operation Homefront has provided programs that offer relief, resiliency, and recurring family support to Veterans, including those in the communities we serve. In addition, the $8 monthly fee for Flex Checking Plus is waived for Veterans*. Flex Checking Plus gives you the ability to earn dividends on your checking balance just as you would a savings. We also reimburse non- Visions ATM fees anywhere in the country. There are no foreign exchange fees on purchases made outside the country. We also waive the fees for money orders and wire transfers. We’re proud to employ numerous Veterans in our workforce of more than 600 across three states. We also have a variety of internships available for Veteran students or those exploring new careers in areas like network security, accounting, facilities planning, marketing, or management and administration. Program valid for veteran service members and their spouses only. Proof of service required and must be shown at account opening. Valid forms of identification include, but are not limited to: Military ID card, Veterans ID card, or DD 214 Form, if applicable. Without Veterans Program waiver, Visions Flex Checking Plus requires $1,000 minimum checking balance or $25,000 in combined consumer deposit/loan balances at all times to avoid $8 monthly service charge. Visions membership requires a $25 minimum deposit. New member is subject to membership requirements and cannot have existing Visions accounts or been a Visions member in the last 12 months. Ask a representative or visit visionsfcu. org for eligibility. New member must be a veteran of United States uniformed services, or spouse thereof. $50 bonus will be deposited to primary savings of new member at time of account opening. Only one bonus will be given per qualifying new member, regardless of number of accounts opened. May not be combined with any other coupons or promotional offers. Bonus is reportable for tax purposes. Visions reserves the right to end or modify this offer without notice. Credit union membership required with a $25 minimum deposit – certain restrictions apply. Check with a Visions Federal Credit Union representative for membership eligibility details. Member must be a veteran of United States uniformed services, or spouse thereof. Bonus will be deposited into the primary savings of the account in which the mortgage was opened within 10 business days of mortgage funding. Bonus is reportable for tax purposes. Only one mortgage bonus will be given per household. Cannot be combined with other mortgage promotions. May not be combined with any other coupons or promotional offers. New purchase or refinance. Applications are subject to standard credit criteria. Loan rates based on creditworthiness and may vary. One- to four-family, owner-occupied, primary residence only. Maximum mortgage dollar amount funded is based on region and property value. Property insurance is required. Flood insurance may be required. Refinancing of Visions debt is not allowed. Program details subject to change. Visions reserves the right to end or modify this offer without notice. Equal Housing Lender. Credit union membership required with a $25 minimum deposit – certain restrictions apply. Check with a Visions Federal Credit Union representative for membership eligibility details. Member must be a veteran of United States uniformed services, or spouse thereof. Bonus will be deposited into the primary savings of the account in which the loan was opened within 10 business days of loan funding. Bonus is reportable for tax purposes. Only one loan bonus will be given per member. Loan balance must be a minimum of $5000. Bonus only valid on new or used auto loans and personal loans. Applications are subject to standard credit criteria. Loan rates based on creditworthiness and may vary. May not be combined with any other coupons or promotional offers. Refinancing of Visions debt is not allowed. Program details subject to change. Visions reserves the right to end or modify this offer without notice.